Rural Women New Zealand (RWNZ) are saddened to hear of the death of a nine-year-old boy whilst riding a quad bike in rural Waikato last night and our thoughts are extended to friends and family. “It is very sad, but it need not have occurred. We need to prevent families and friends from the heartbreak of losing a loved one in such tragic circumstances,” says National President, Fiona Gower. 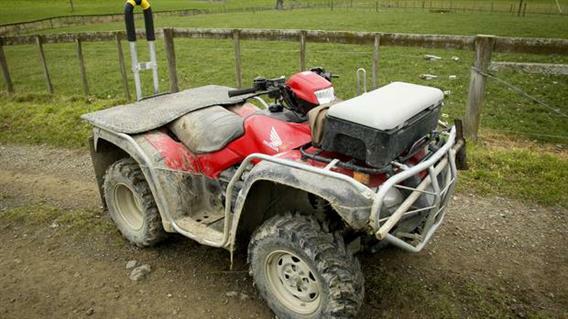 “RWNZ are concerned on two levels, one is children riding age appropriate quad bikes unsupervised and the other is children under the age of 16 riding adult-sized quad bikes. “Last nights’ incident is an unfortunate but timely reminder of manufacturers recommendations that children under the age of 16 should not be riding adult-sized quad bikes. “Children do not have the weight, strength or judgement to be operating these vehicles. “Or if young children are riding age appropriate quad bikes, they need to be wearing a helmet and be supervised at all times. “RWNZ encourage that anyone planning to use any form of machinery on farms receive training, and learn safe practices. “It is heart breaking to receive news like this,” says Ms. Gower.